Noticed this week that the graph on the HPC front page clearly looks like the index has peaked/turned. Looking forward to see it going down again soon. In fact. the recovery doesnt really look much like a recovery when I look at the graph. I negative from nationwide tomorrow/Tuesday will make that graph very interesting! I'm going to go out on a limb a predict a negative. All anecdotal evidence i'm seen and the official figures + new government says to be...negative. At a minimum we all hope that the rampant pwoperdee inflation of Q2-Q4 2009 [an insane sugar rush driven by zero interest rates] is at an end obviously. And, whilst it's early days, the data for 2010 so far seems to suggest to me that it is. Halifax is down slightly for 2010, Nationwide more or less flat I think [need to check?]. There was talk of new instructions oustripping 'demand' even before the news on CGT. Austerity measures hanging over us. I would be very, very surprised if about half of the Q2-Q4 2009 inflation, maybe more, wasn't reversed by the end of this year. LR figures for April out 1st June, I'm expecting at least -1% then down to at least -2% each month for the rest of the year. Once it starts it going to drop fast, if BoE is forced to raise IR's this year, I think we will see mortgage subsidy schemes pulled and all hell will break loose. I think the mortgage subsidy scheme is the main thing...we are supporting new mortgage lending...the government has a MASSIVE hole to fill, 6.2 Billion doesnt even dent it, they need to stop given 10's of billions to the banks to support house prices. I wouldnt bet against the tories driving ti all down quickly for 2 years then spending 3 years making everyone feel better/richer. Talking of graphs, is anyone able to post a particular graph I have seen, it is of the investment cycle, done in a kind of toungue in cheek way, showing a bull and bear market and the stages at which people invest. Shows bull traps and bear traps, with comments. I know it is not a great description, but I think if you have seen it you will know what I mean. Edited to say, forget it, just found it under the graphs link, doh, should have looked there first! I think you mean this one...? Nationwide are seasonally adjusted. So a small negative would just mean less spring bounce than normal. LR figures are lagging by three months ish. So our anecdotal oversupply won't be factor in. Still a third consecutive negative would be great! It's the only thing they can do and I think they will resist 'printy printy' at all costs. Lets face it apparently we've recovered from the biggest recession in history without so much as hiccup. Anyone who believes this is over and the recovery is upon us is in for one almighty shock. Yes, thats why I'm not expecting to see -2% until the July figures come out. Its disappointing the graph was only updated last in january 2010. I have questioned this on a number of occasions. If you have a look at the table of monthly and annual moves you will notice House Prices are still on an upward path. Would that be because it's a quarterly graph ? 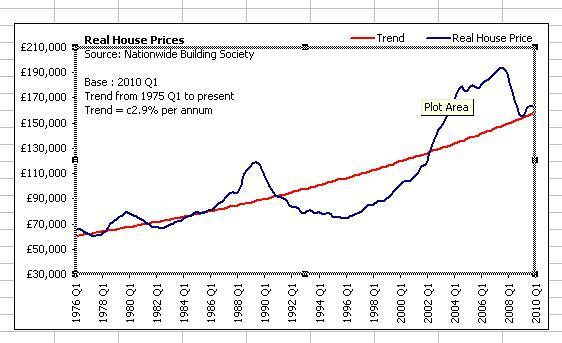 I thought house prices were gong down in the last quarter. You take london out the equation ( which is in for A MASSIVE CORRECTION ) then the graph would be way down. EDIT: Ive downloaded the latest data avilable from the Nationwide....I get the same graph...So i guess it's a quarterly graph. Same result tho...the dead cat bounce has bounced and we are left with one big dead cat. The trend definitely doesnt look up !!!! Don't forget that the graph is inflation adjusted, RPIX I believe - which is currently running at around 5%. AFAIK the Nationwide index is not inflation adjusted so even small increases in the Nationwide index mightl appear as decreases on that graph. figure tomorrow will tip it down at the end. Makes sense. The posters comment about it not including the lastest figures which were all positive sounded a bit bullish to me, considering the considerable bad news and unstoppable momentum toward drops/collpase. The so-called recovery seems to have run out of puff. I look forward to new points appearing on the graph.